Potato salad is so woefully misunderstood. So many assume that it is laden with Miracle Whip or mayonnaise, and that it is not vegan friendly. The truth is, potato salad can be so delicious, fresh and simple, that its usual heavy, mayo-laden incarnation seems outdated. Give this a try and see what you think! Cube potatoes and boil until tender (test with fork). Cook peas according to directions on package. Run both under cold water and put in same bowl. Dice red onion and add to the potatoes and peas. 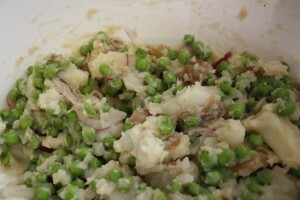 In a separate bowl, mix the remaining ingredients, and then add to the potatoes and peas, mixing with a spoon. Test it and make sure it is salt and peppered to your liking; if not, add more. Refrigerate until you are ready to serve! Yields 6-8 servings. Feel free to make this up to a day or two ahead of time, it will only get more delicious!